'Italian sports car for sale, probate disposal, late relative's car, we don't know much about it but just need it gone, £995.' Who doesn't dream of that scenario where some fool mistakenly puts an F40 up for sale at under a grand? In your fantasy, somehow you're the only one who sees the ad, and somehow you manage to remain calm as you seal the deal for £850. Actually, this sort of thing really used to happen. Many years ago an old bud of Shed's spotted a very sorry-looking car on a back street in north London. Apparently it was being used by a builder to store his bricks. Underneath the coating of cement dust was a Ferrari 275GTB, which Shed's pal proceeded to pick up for a sum that wouldn't even get you a beaten-up 308 today. This week's Shed isn't quite on that hang-on-a-minute level, but it is true that if you looked only at the bot-generated spec at the bottom of the ad you probably wouldn't have given it a second thought. 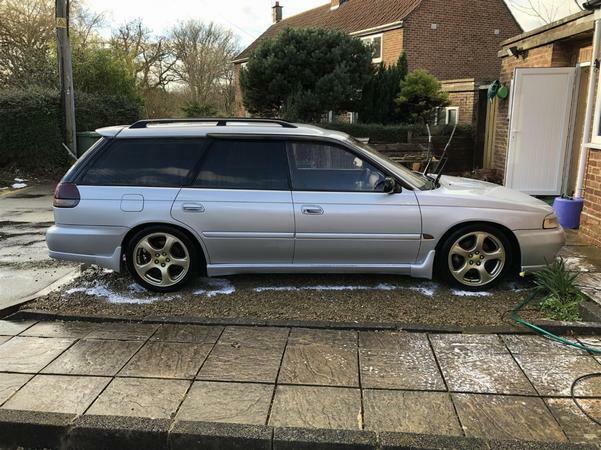 That ad spec has this gen-two Legacy wagon down as a non-turbo model parping out a weedy 138lb ft of torque and a sniffling of power so small it's not even worth mentioning. 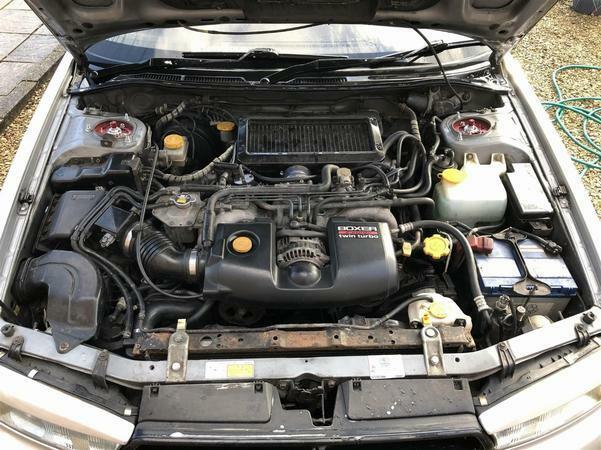 The reality, as most of you will have noticed, is that it is a twin-turbo EJ20R Legacy GT-B - a very different bucket of permanently four-wheel driven whelks pumping out something in the order of 275-280hp. Even in an 1,800kg beast like this, that's enough for a six-second 0-60 time. The same-size (pretty much) turbos operate sequentially, the primary one designed to give you grunt off the line before it temporarily de-spools in the midrange. Somewhere between 3,500 and 4,000rpm a secondary turbo wakes up. Although the primary turbo does then re-engage to work with the secondary one, that momentary de-spooling effect causes a power gap amusingly acronymmed by the Legacy TT community as the VOD - the Valley Of Death. Fortunately, there is a Bible-load of vaccum and solenoid-related info online about how to turn that VOD into a POP (Plain Of Pleasure) so you shouldn't let it put you off too much. In fact, some TT aficionados have made a sort of positive out of the 4,000rpm thump, it's like their V-TEC yo, but in reality it's a bit of a pain as it's most obvious and intrusive during upchanges. Left to its own devices, the Subaru four runs to 7,500 but most of the action is over by 6,500. The GT in GT-B means it's an estate (the saloons were RSs), but what does the B stand for? Mainly for Bilstein, but also for Bigger Brakes and Beefier anti-roll Bars. As you can see, this car no longer has its original Bilstein front and rear struts, but the adjustable MeisterR coilover replacements look like a very fair exchange. Shed thinks that the design of these MeisterRs allows you to independently adjust the ride height and the spring tension, so that lowering the ride height doesn't affect the damping. But then Shed thinks a lot of things, not all of them correct. Anyway, a new set of these MeisterRs would cost you half the asking price of this car, so that's a good start for our £1,500 GT-B. One of the rear top plates seems to have taken a biff at some point, though that could be a trick of the light. Whatever it is, it doesn't seem to be in a critical area. Disclaimer: Shed is not a lawyer or an engineer, real experts are available etc. The ad headline says it's a 2008 car, which it clearly isn't. The ad copy says it's 1998, but the P-reg plate says 1996. These twin-turbo units would only fit in right-hand drive cars, and as such were only officially sold in Japan, Australia and New Zealand - not in the UK, though, boo - so let's go for a 1996/98 car that was imported from Japan in 2008. The important thing is that it's got a valid MOT certificate from a January 2019 test which came up with just two advisories: one, our old favourite the corroded brake pipe (offside rear); the other, a worn rear brake disc, which judging by the ad has since been addressed by the fitment of Brembo discs and pads. A good thing really because Legacy rear discs are known for scoring and original Subaru parts generally are famously expensive. In the context of what else you're getting here, these are hardly deal-breakers, especially when you see that the expensive cambelt and clutch have both been replaced in quite recent memory. Having said that, these EJ20 TTs do have a bit of a name for big-end failure. Cold-start knocking is a sound you don't want to hear. If you go to see this one, you might want to insist on it not being warmed up before you arrive. Getting past the 100,000-mile mark, as this car has done, is important. The hill start assist that many of us think is a fairly recent advance was in fact present on Subarus from 1994. They called it the Hill Holder. Its hydraulic/brake pressure mechanism does need monitoring if you don't want your brakes to jam on. Obviously it's an old Japanese car too so look everywhere you can for rust and check the underside for rock dents. 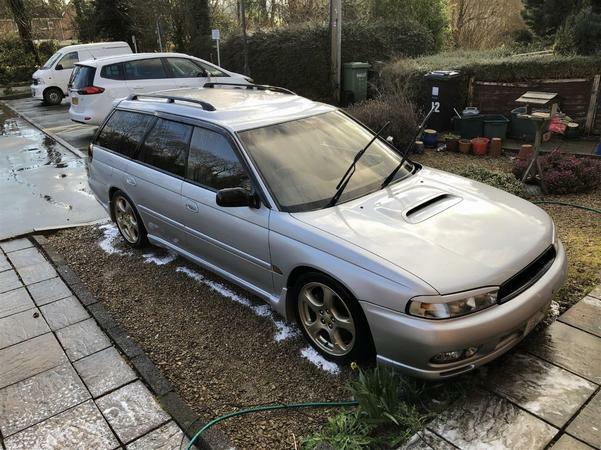 Summing up, this is a big, handy, credible and quick estate that any self-respecting PHer should be proud to have on their drive. There's the thing, though. Leaving it on the drive might be something you find yourself doing quite a bit if you have the keys to another, less juicy option, like say a blown Jag or a V8 Merc. Mid-20s mpg figures are on the cards here if you take it reasonably easy, but you can knock 10mpg off that if you're planning on extending your right leg. Basically, don't buy it unless you're prepared to do without the odd meal in order to keep it fed. The vendor also tells us that the wheels are coated in classic Subaru Gold GK1 paint, which if you're interested was one of the first gold paints to be used in mass car production. One to thrill your next dinner guests with. I seem to be saying this every week, but that's a great shed. The denizens of uklegacy.com are a good bunch too. Good info on technical issues and finding parts. That’s a lot a car for under £1500. Makes me wonder when 90s cars like this will start picking up in price like 80s motors are at the moment. Blimey! Good shed with no need for brave pills. Why are PH articles always riddled with inaccuracies? These weigh around 1400kgs, nowhere near the 1800kgs stated in the article.